TEXARKANA, Texas – Texas A&M University-Texarkana Associate Professor of History Dr. Craig Nakashian has been named to the Chancellor’s Academy of Teacher Educators by Texas A&M University System Chancellor John Sharp. The Academy is an initiative of the Texas A&M University System, acknowledging teaching excellence. The program is supported by the Chancellor’s Century Council, a group of private donors committed to advancing the future of higher education in Texas. Dr. Nakashian holds bachelor’s degrees in History and Government from Western New England University, a master’s degree in Medieval History from Durham University in England, and a Ph.D. in History from the University of Rochester. He has been at Texas A&M University-Texarkana since 2010 and taught previously at Southeastern Missouri State University, Syracuse University, and the University of Rochester. Dr. Nakashian is originally from western Massachusetts. His wife Zoe, originally from Plymouth, England, is the Collections Manager for the Texarkana Museums System. They have two children- a son, Meran (11) and a daughter, Pelin (7). TEXARKANA, Texas – College Factual recently reviewed 1820 colleges and universities nationwide to rank them according to which institutions are the most veteran-friendly. 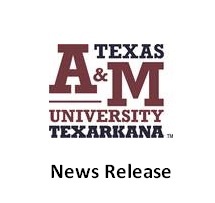 Texas A&M University-Texarkana ranked in the top 15% of all schools in the nation in the “Best for Vets” category and finished #16 out of 79 schools reviewed in Texas. The ranking is meant to highlight colleges and universities who are working hard to provide quality educational outcomes to veterans, active duty military students and their families. Some of the quality factors included in the rankings are veteran affordability, veteran support services and resources available, and overall quality metrics important to any student – particularly those metrics important to non-traditional students. TEXARKANA, Texas – Several Texas A&M University-Texarkana math students competed in the recent 2018 Student Challenge Using Differential Equation Modeling (SCUDEM) and presented their mathematical model at Texas A&M University-Commerce. Two teams of students participated in the event, working diligently to solve their projects between October 19th and October 27th. Each team member contributed between 20 and 25 hours to their plan. A&M-Texarkana’s TEAM A, (comprised of Ryan Powell, Katelin Garamillo, and Nathalie Alvarado) was given the Meritorious Award, and Team B (made up of Rebecca Thompson and Claire Reyes, received the Successful Award. Additionally, Ryan Powell and Rebecca Thompson were awarded the 2nd place in the Math Bowl competition, and Nathalie Alvarado received the 3rd place.